Willie Mullins and his nephew Danny were first off the mark at Wexford on Friday when 11/2 chance Pont Aven landed the rated novice hurdle in grand style. Eoin Griffin won the 2m handicap hurdle with Scotch Quay which scored a three-length success in the hands of Ricky Doyle. Mullins was also a winner at Fairyhouse on Sunday where Great White Shark came good in battling fashion in the opening mares’ maiden hurdle. With Paul Townend sitting out the day after his Aintree tumble, Ruby Walsh proved an able deputy on the well-backed 6/4 favourite which won narrowly from the more-locally trained Rhythm Divine. Mullins and Walsh doubled up when taking the Grade 2 novice hurdle with 15/8 favourite Mister Blue Sky. Owned by the Shanakel Racing Syndicate, the five-year-old was strongly pressed all the way to the line by his own stable companion Cash Back. Mullins has now won the race for six of the last seven years. Scotch Quay made it two wins in a week when following up for Griffin and Ricky Doyle at Fairyhouse on Sunday. The 7/2 favourite had terrific luck on his side however as Breesy Mountain looked the winner only to fall at the final flight. His exit left Scotch Quay clear to win by five lengths from No Way Jack. The early days of the 2019 Flat season have been kind to Jim Bolger and the Coolcullen trainer was among the winners at Leopardstown on Wednesday. He again teamed up with Kevin Manning to win the 10f handicap with 13/2 chance Latchet which paid her way throughout the winter months at Dundalk. Bolger and Manning were also winners on the all-weather on Friday evening where Moments Linger was a winner at the second time of asking in the 5f maiden. The 6/5 chance was always doing enough to hold off the late surge of even money favourite Yesterdayoncemore and were back in the winners’ enclosure as Gasta scored a last gasp success in the 8f handicap at Cork on Sunday at odds of 6/1. While his father Aidan dominated at Leopardstown on Saturday, Joseph O'Brien landed the first winner of the afternoon as newcomer Buckhurst took the 8f maiden at the main expense of a Ballydoyle runner. The 7/2 chance was ridden by his brother Donnacha and got up on the line to pip Jack Yeats by a nose. The brothers were the big winners at Cork the following afternoon where recent recruit Cimeara gamely won the 12f Listed Noblesse Stakes. Trained by Jim Bolger last season, the four-year-old was possibly running over a trip on the short side for her but she held off the late challenge of 11/8 favourite Who’s Steph to win by half a length at odds of 7/1. 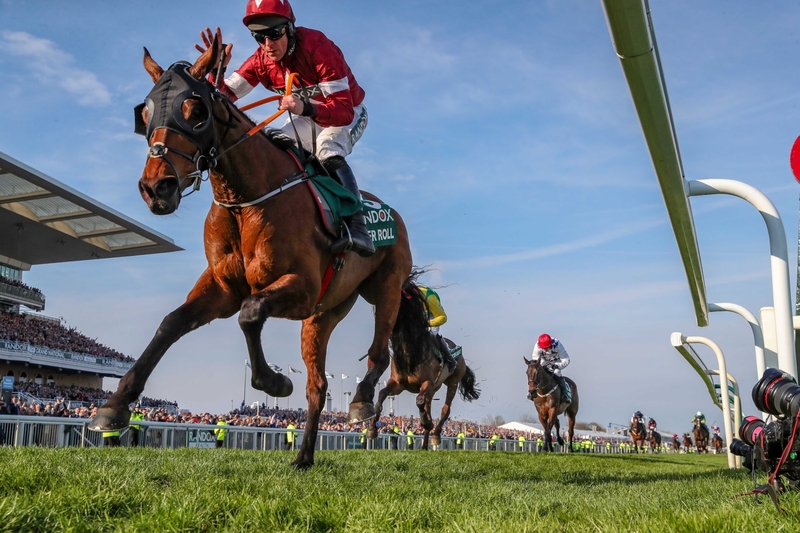 Tiger Roll's place in sporting history was confirmed as he became the first horse since Red Rum in 1973 and 1974 to win the Aintree Grand National for the second consecutive year on Saturday. Elliott was overcome with emotion as he won the race for the third time, he also trained Silver Birch to win the 2007 renewal. “We work very hard for this the whole time. I've got a brilliant team behind me, and all my family at home. Davy Russell's mother died last year, and this was for her, and my uncle Willie Elliott died this year, and this was for him. Irish trainers were back at Aintree in force this year and the first big winner for the visiting team came in the shape of the Willie Mullins-trained Kemboy in the Grade 1 Betway Bowl Chase on Thursday. The Ruby Walsh-ridden 9/4 favourite made all the running and was not for stopping as he powered clear to beat Clan Des Obeaux by nine lengths with the Henry De Bromhead-trained Balko Des Flos in third place. Supasundae gave Jessica Harrington and Robbie Power another top-flight success when landing the Betway Aintree Hurdle, the fabulous nine-year-old winning by a length and a quarter from Buveur D'air at odds of 15/2. At Grade 3 level, Henry De Bromhead and Rachael Blackmore won the Close Brothers Red Rum Handicap Chase with 11/2 shot Moon Over Germany which sports the colours of Philip Reynolds. Friday started well for subsequent Grand Notional hero Gordon Elliott as landed a quick double, two winners he shared with Jack Kennedy. The pair landed the opening 2m4f handicap hurdle with the Frank McAleavy-owned Three Musketeers and followed up in the Grade 1 Betway Top Novices’ Hurdle with Felix Desjy which made all the running to beat the Mullins-trained Aramon by a length and a half. Robbie Power got his second Grade 1 winner of the festival as he partnered the Colin Tizzard-trained Lostintranslation to win the Betway Mildmay Novices’ Chase. Robbie Power landed his third Grade 1 of the week when once again combining with Colin Tizzard to win the Betway Mersey Novices’ Hurdle with 20/1 chance Reserve Tank. Power ended the three days at the Festival’s leading jockey. Henry De Bromhead and Davy Russell took the Grade 1 Doom Bar Maghull Novices’ Chase with Ornua which made all the running to beat the Joseph O'Brien-trained Us And Them. It was fitting that Gordon Elliott landed the final Aintree winner when the Jamie Codd-ridden Chief Justice just held on to win the concluding handicap hurdle.